Abdomen (less formally cried the belly, stomach, tummy or midriff) constitutes the pairt o the body atween the thorax (chest) an pelvis: in humans an in ither vertebrates such as mammals. 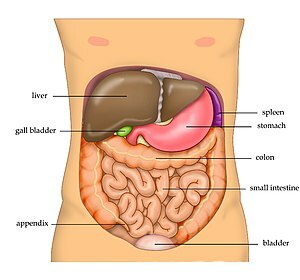 The region enclosed bi the abdomen is termed the abdominal cavity. In arthropods it is the posterior tagma o the body; it follaes the thorax or cephalothorax.